I took this trip back in January before the snow finally started falling. 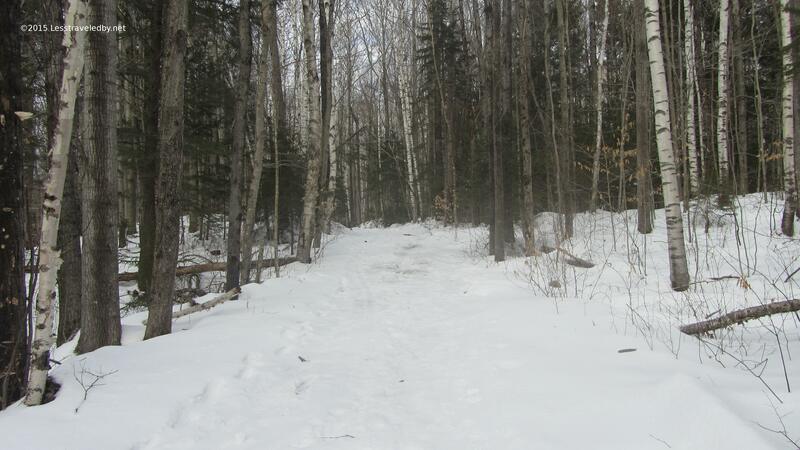 The Lincoln Woods parking lot was a solid slab of ice from the mid-winter thaw a few weeks prior. I put on my trail crampons before I pulled my pack out of the car. The Eastside Trail was bad until the washout and then much worse after that. The whole trail was covered in frozen footprints and I was really glad I’d brought the spikes in addition to the snowshoes. 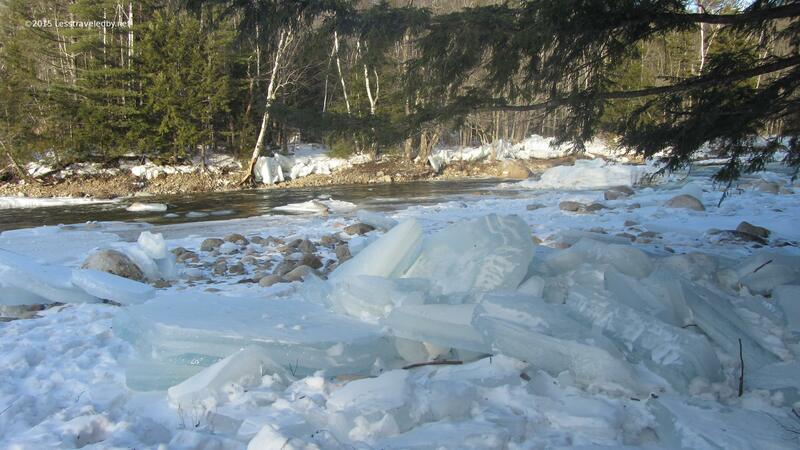 The river was littered with giant slabs of ice on both sides. 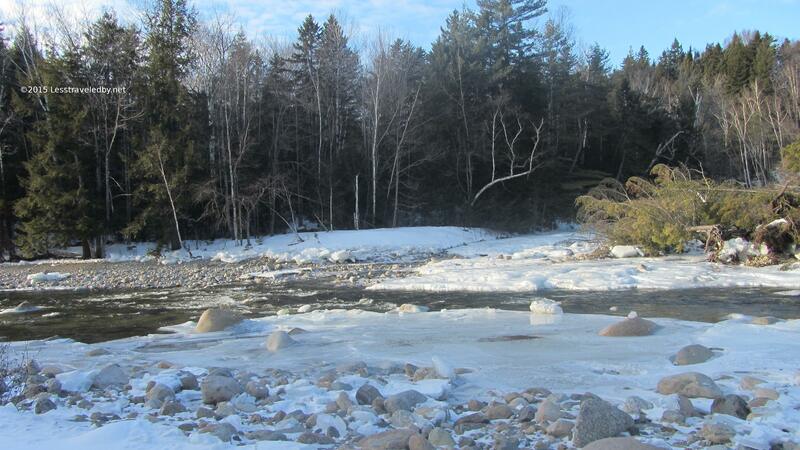 The thaw and rain had produced a huge flow that literally exploded the thick ice cover from the river. The slabs were 8-10 inches, varying in size from dinner plate to dinner table. Most were pretty big making an impressive sound when thumped. 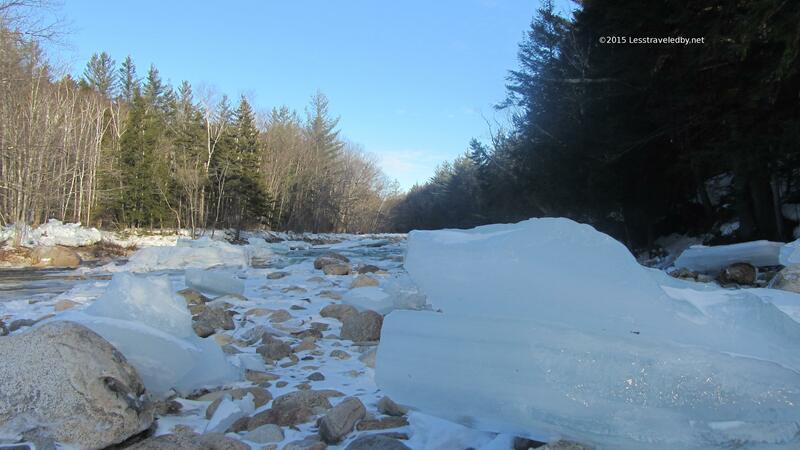 The big ice pieces also made some interesting noises floating down the river bouncing off of rocks and the encroaching ice cover. 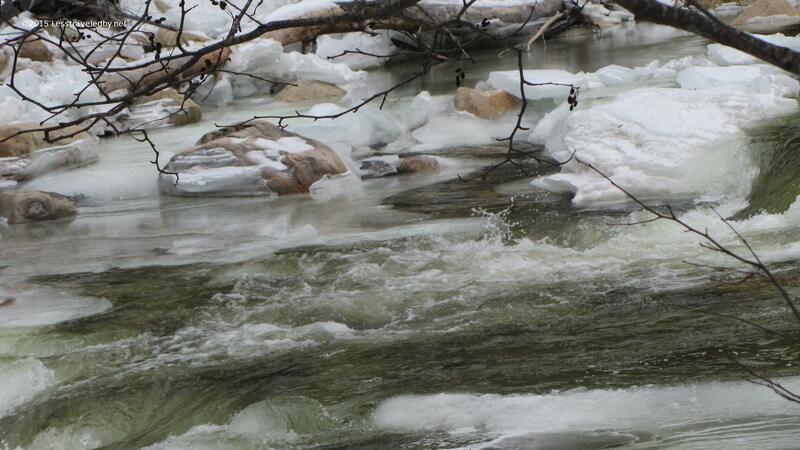 I’ll bet they were making some really interesting noises when the thaw hit and the river exploded! Just after I set up camp the sun popped out for a little bit. Temps were in the low teens but the wind wasn’t doing much so it didn’t seem too cold. 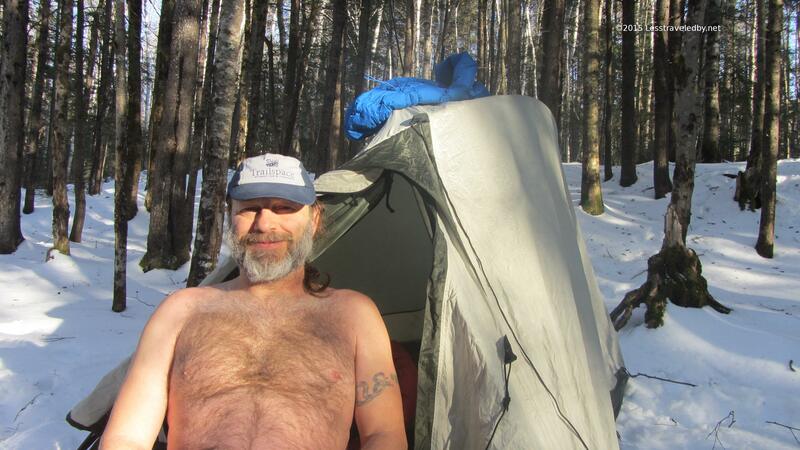 Once I finished setting up camp it was time to get rid of a sweaty base layer to get ready for hanging out in the cold. 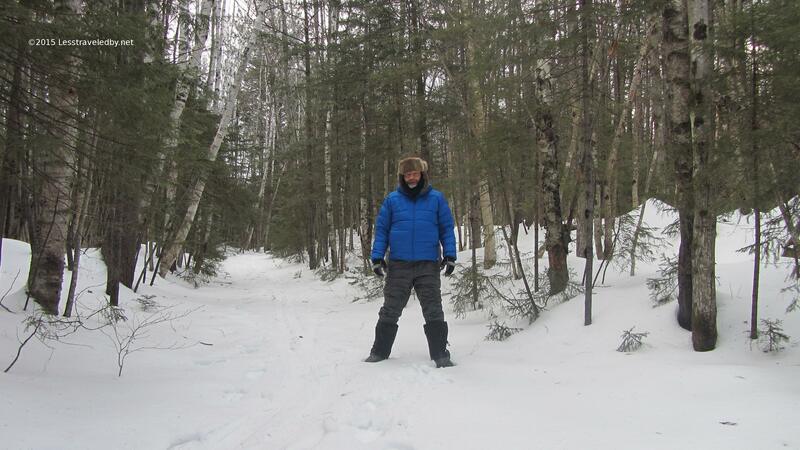 Winter camping is all about maintaining your body temp because it is hard to catch up once you get behind. Taking a minute to swap out my base and let my fur air dry for a minute would keep me warmer in the long run. I use a two man tent for winter solo trips to give me plenty of room for gear. 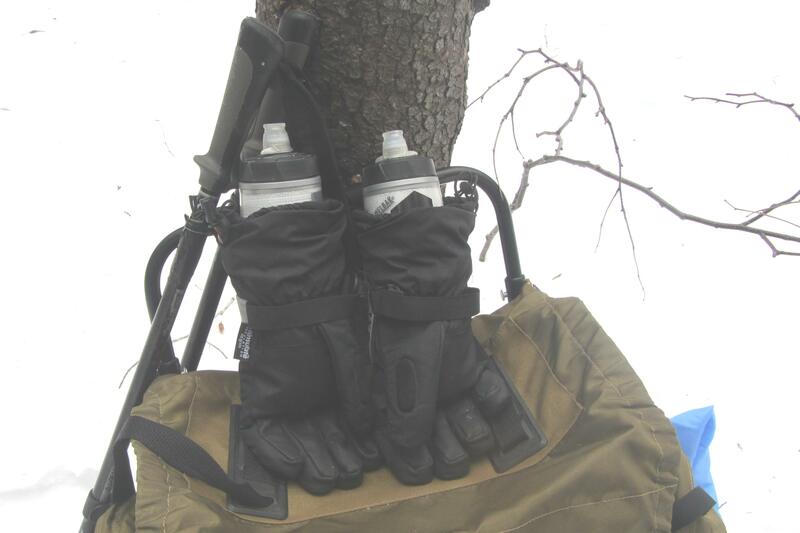 This is an old TNF Tephra 22. They still make a tent with that name but it is very different. Mine is really a three season tent, but I’ve figured out how to use it in the snow pretty well over the last few years. Once I got all settled in and warmed up I pulled out a book I’d brought to pass some time and realized I’d left my glasses in my pack outside heh. I’ve only worn glasses a year or so now and still forget I need them though that chilly trip to fetch them should help me remember next time. This is how I dressed when I got up the next morning as my fur was no match for the low single digit temps. Puttering around camp a person doesn’t generate a lot of heat so it is important to hang on to what you’ve got. 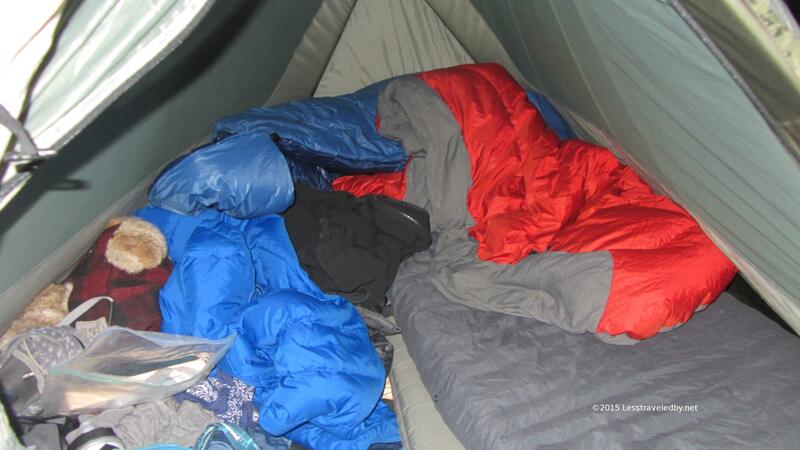 These water bottles spent the night inside the tent with me tucked inside gloves in hopes of not freezing solid. The one with warm water was pretty slushy by morning and the other was almost frozen solid. 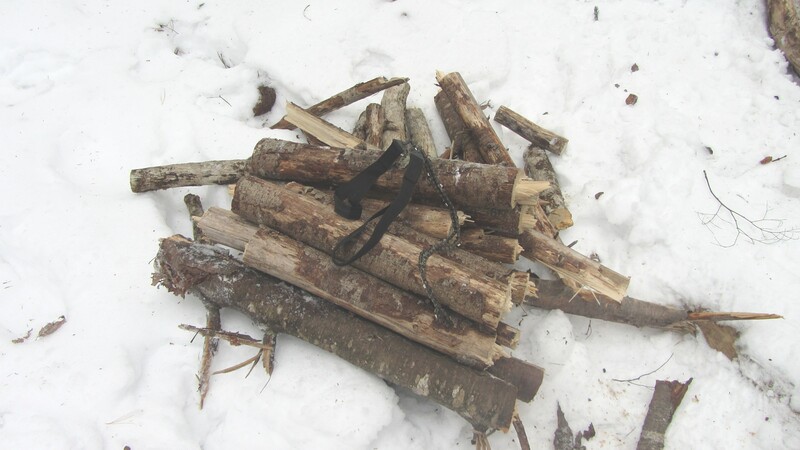 One thing I did to generate some heat that morning was to cut up some firewood. I figured that afternoon I’d build a fire. I don’t usually bring a saw but this time of year it is nice to be able to burn bigger pieces of wood that last a bit longer. Finally there was a reason to get the snowshoes out! 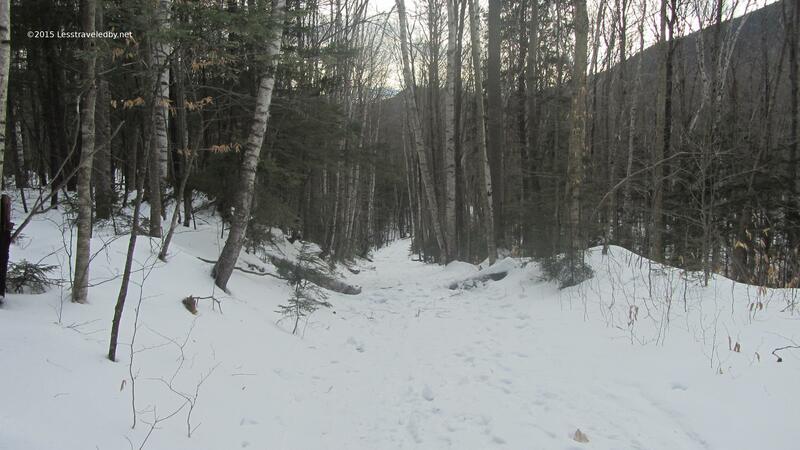 I headed off into the wilderness towards Cedar Brook. 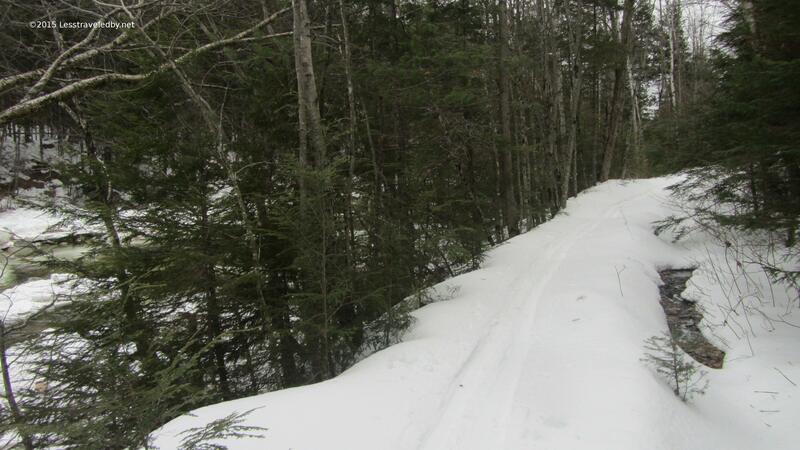 There was a ski trail broken out which I tried to avoid as I broke out a snowshoe trail next to it. The ice was trying to reform on the river below. 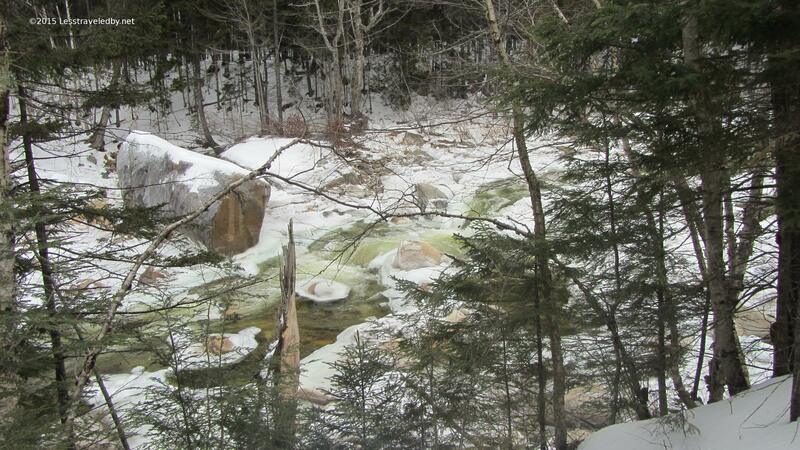 It made for some interesting views and the sound of water took some of the edge off my crunching through the snow. Looking at these pictures makes me shiver now, but at the time I was warm. Something about breaking trail even in shallow snow will do that. I was expecting snow that evening and by noon I could see and feel the storm coming. The wind picked up a bit and there was more of a bite to the air. I needed to make some more water anyway so I figured it was a good time to make some cocoa while I had the stove out. Up til this point I’d gotten away with using my canister stove by keeping the fuel can in my jacket for a while before use. 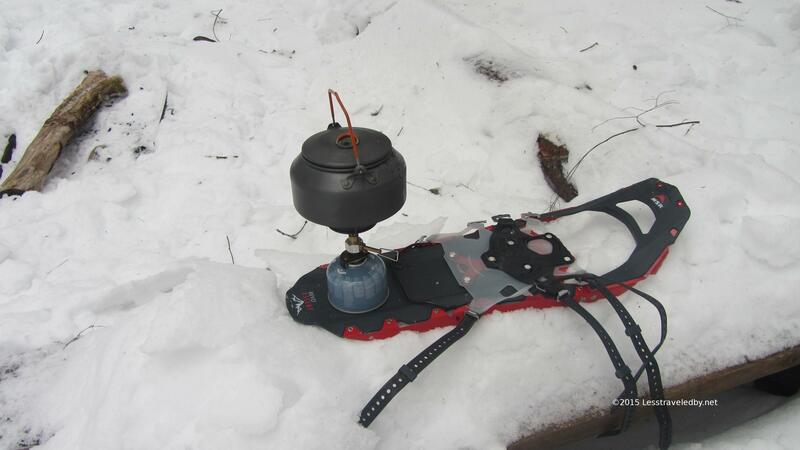 A snowshoe made a good base for keeping the can out of the snow. This time though I think it was too cold for the O rings as I couldn’t get the stove to seal to any of the canisters I had with me. I considered lighting a fire, but the thought of my pretty GSI kettle charring over a wood fire made me sad. So since I had daylight to get out I packed everything up and hit the trail. With all the new winter gear I’ve acquired my ability to survive the cold had surpassed my stove which I found oddly satisfying. This entry was posted in Nature, New Hampshire, Uncategorized and tagged Backpacking, Camping, Hiking, Maine, Nature, New Hampshire, Pemigewasset Wilderness. Bookmark the permalink. Hello, I’m a new subscriber. I really enjoyed this post. Beautiful photographs of the ice and river. What an ambitious trip! Inspires me even though I am a three season camper. Yes, indeed on both counts, rewarding to camp in winter and need for preparation and equipment. I’ve been in a couple of challenging circumstances in cold weather with car camping, so I’d be extra cautious about winter camping. Mild hyperthermia with my 4 year old child in my sole care in the woods on a mountain side taught me a valuable lesson I never forgot. It sounds like your lesson of being three miles in and realizing you are not prepared. I don’t have much backpacking experience, only a handful of times. I have backpacking gear. I do solo car camp and walk-in camp, most all my trips are solo. I’ve had to pack up and leave after dark due to security issues a couple of times. Not a bad record for many nights out over about 3 decades. Mostly I have wonderful memories in peaceful places. I don’t camp much now and haven’t for years–corporate America beat me up and like many my passion for being out there got lost in the mainstream hustle. I’ve been recovering and thinking about camping again. I’m having a grand downsizing event here at home. Funny, I just got out my camping/packing gear yesterday to see what I have and determining if anything can be downsized. Not much is leaving! Amazing the fondness we can have about our gear. I’m thinking of some winter day trips. 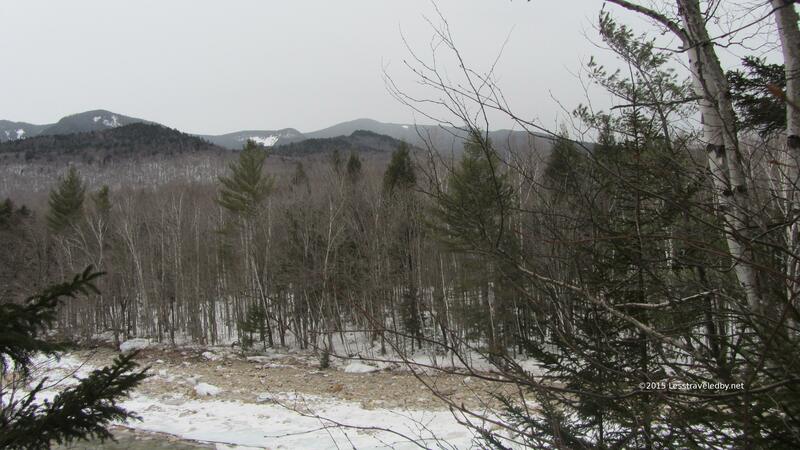 I’ll be making some late winter/early spring camping trips too. It’s past time for me to do what I love to do, be outside. Your blog really inspires me. Thank you. You have a nice page! I really enjoyed reading up on your trip. I miss all the snow & ice we used to get from time to time in the S Apps. Now I live farther south and we get excited over sleet. Which stove did you get for your winter stove? I picked up a MSR Whisperlite Universal which is why I asked you about that stiff fuel line the other day. I love getting out this time of year because you don’t have to go very far before you stop seeing people. This spot I’m camping is a zoo in the summer but I had it all to myself. Would like to get back out there Thursday but it would be two -8°f nights and I’m not sure I’m that committed. Might try to find some place closer and just do an overnight stealth.